The Lamb Jam is one of my favorite foodie events. This year's Boston Lamb Jam took place on Sunday, February 19th at the Charles Hotel in Harvard Square. It was definitely more crowded than last year, so I'm happy we got there early. The event started at 3pm and we were in line at 2:15pm, eating by 3pm. My trick is to get there early for any food festivals to eat as much as possible as soon as possible. The event took place in the upstairs banquet area of the Charles Hotel. The room was split in half with some of the best restaurants in New England on the outer edges of the room. The center was a bar with local, exciting beers. As we entered the Lamb Jam, there was a room of lamb swag, a room of lamb, wine and beer. The best part? The event was a contest. I got to feel like a judge on top chef. 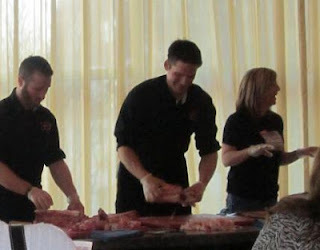 There were entrants in each of four categories: leg, shank, shoulder and loin. The room was split up into quarters. When we got into the room with the food. We went straight for the leg/shank half of the room and we were thrilled. My first taste was Brian Reyelt's lamb leg and bone marrow polpettone with Bourbon cherries. 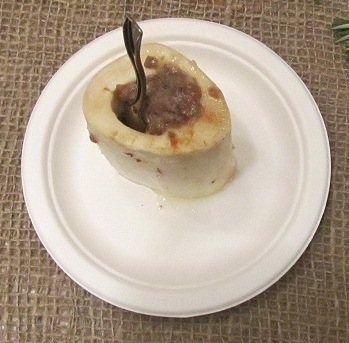 The dish was from Citizen and was presented in a bone. Please see the picture below. I was wowed by the creativity and tastiness. I did not know that I liked bone marrow but this was simple, delicious and flavorful. I had been hearing great things about Citizen and now I know the reviews must be spot on. We lucked out because by the time other people started flooding in, we moved on to the "Shank" area. Here, below, my favorite dish was by Jim Solomon from The Fireplace. It was a Mayflower Porter braised lamb shank with sweet garlic yogurt and blood orange over cheesy grits. I enjoyed this dish and one of my friends loved it so much that she went back for seconds. It was a full mini-meal which made it a lot of fun to eat. It was flavorful and beautiful. Last year my favorite two dishes were from Pain D'Avignon and Bistro du Midi. This year both were good but different, to be expected. Pain D'Avignon had lamb jelly donuts. They were beignets with lamb butter in the dough and lamb and jelly inside. I look forward to going back to Pain D'Avignon for their lamb hot dogs/hamburgers because they are my true favorite lamb dish that they make. Bistro du Midi had a really unique smoked lamb dish this year. Once we finished the first half of the room, we traveled across to the very crowded shoulder/loin side. The shoulder winner overall (by the judges panel) was Brian Alberg's meatballs. They were lamb shoulder and kale with smoked tomato puree and Parmesan crustade. I enjoyed Tavolo's beer braised lamb shoulder with seared potato gnocchi and saffron pepper sauce. Both dishes were great and make me want to check out the restaurants. I've heard rumors that the Red Lion Inn is worth the drive to Stockbridge. Can't wait to try more by these chefs! As for the loin, I already mentioned Bistro du Midi. My favorite in that category was also the judges' favorite. Matt Jennings from La Laiterie made a Korean lamb Reuben with lamb potato chips. It was really fun and tasty. This dish was a full meal and was a lot of fun to eat. By the time we had finished all eighteen of the lamb dishes we were full and it was only 4pm. What to do? We drank some delicious wine, beer and coffee. There was a stand with Captain's cold pressed coffee in beer bottles. This is photographed below. I was excited that these were bottled in beer bottles. What a delicious treat. By the time we made it to this stand, all they had back was the hazelnut flavored. It was smooth, cold and delicious. Additionally, they had butchering demos. Originally, I did not think I'd go to this because I feared that I would see them break down a lamb from its full form and that I would not be able to justify all of the meat I consumed. Thank goodness it was just talking about different cuts. This session was led by my buddies at the Meat House. My only wish was that I had gotten some trivia right and taken home some fresh cut American Lamb. All in all, this food event was one not to be missed. Lamb Jam should win a lamb trophy for a fantastically delicious event. My taste buds were alive with the taste of lamb. It was a fun event and a delicious way to sample many restaurants that I do not eat at regularly. The list of 18 restaurants at this event will fuel more food adventures. My countdown is starting for next year's Lamb Jam. Are there any food festivals that you enjoy? I am always looking for additional ideas.